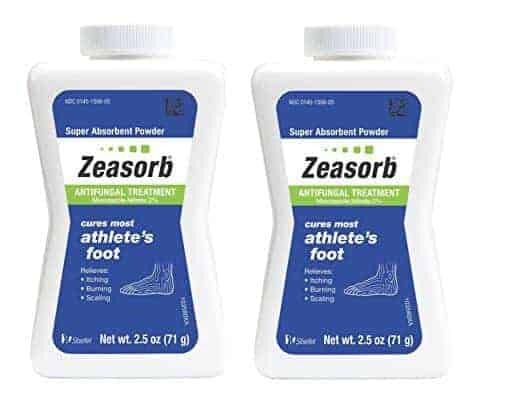 Athlete’s Foot can be challenging to treat; luckily there are a lot of different over-the-counter remedies on the market including soaps, creams, foot soaks, powders, and sprays created to kill off the foot fungus. Dealing with fungus is a process that often takes a little while to work, and what works for one person may not work for another. It can be helpful to attack it in a few different ways to have the most chance of success. We have rounded up some of the best products that work on helping to get rid of Athlete’s Foot. When you have athlete’s foot, you need to make sure you are washing your feet twice a day with an effective soap. 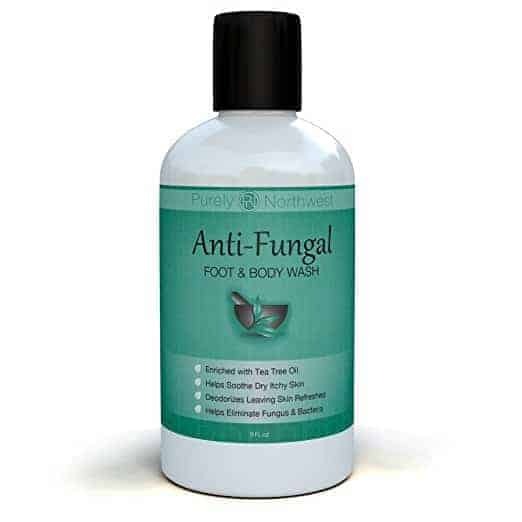 A soap that a lot of people like to treat fungus is the Antifungal Soap with Tea Tree Oil from Purely Northwest. It is incredibly popular, mostly due to its effectiveness, but partly because of the scent and the price of the soap. It works best if you use it twice a day in combination with a cream or powder, although some people report that the soap alone has helped to clear up stubborn infections that even not even prescriptions were able to cure. 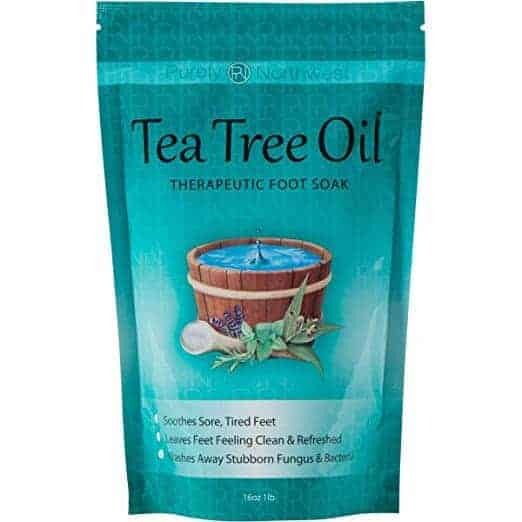 If you prefer a foot soak, the same company as the soap listed above also has a Tea Tree Oil soak. It is straightforward to use; you just have to soak your feet in some water with the soak for 15 – 20 minutes every day. It may sound like too much work, but it can be an excellent way to relax and unwind after a long day at work. 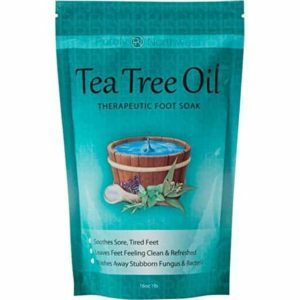 Like the soap, the tea tree soak appears to be extremely useful for lots of different people who have been dealing with athlete’s foot. It also works well to help combat odor. This soak probably won’t be effective enough on its own, so to get the best results you may want to use it in conjunction with other products, at the very least an antifungal soap. If you also have nail fungus, you may want to want to try the 3 item treatment from Purely Northwest. 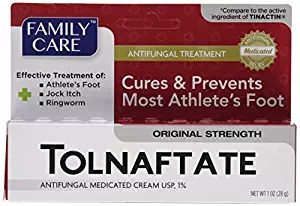 Creams that contain clotrimazole work by preventing fungus from growing, it is an active ingredient that is mainly used to treat athlete’s foot, jock itch, and ringworm. Like all antifungal creams, you must use it consistently until the infection has gone away. Clotrimazole Antifungal Cream from Family Care isn’t one of the big brand names but it is affordable for the amount you are getting, and it is virtually the same as Lotrimin for a much lower price. Sometimes to kill the fungus you don’t want to have to worry about using too much cream because it is too expensive, with this product you don’t have to worry as much about the amount or the cost. It is easy to apply and doesn’t leave a sticky residue making it a good budget alternative for fungus infections. If you have been dealing with fungus for a while, you will probably have already come across Lotrimin. It is one of the most well-known over-the-counter creams that is successful for a lot of people. If you have tried their cream and found that it didn’t work for you, you may want to have a look at their stronger ‘Ultra’ cream. The active ingredient in the regular Lotrimin Cream for fungus is clotrimazole 1%. The Lotrimin Ultra Cream uses butenafine hydrochloride, which is a prescription-strength active ingredient that some people may find works better for the itching, cracking and discomfort that can come along with a fungus infection. It is one of the strongest over-the-counter athlete’s foot creams that you can get. 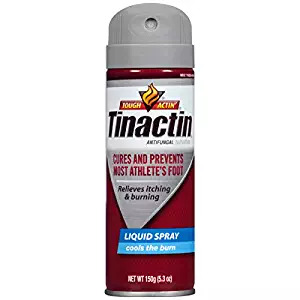 Tinactin is another one of the big brands that people often turn to when fighting an infection. Its active ingredient is Tolnaftate 1 %, which kills the fungus that you have and can also prevent fungal infections. Tinactin has a wide range of products to choose from including sprays, powders or creams. If you don’t enjoy using a cream, check out the liquid spray (pictured), it is easier to use than a cream. Part of the problem with treating foot fungus is that you need to do it twice a day and it can be kind of time-consuming and challenging to remember. This spray makes it a little easier to do the treatments because it is so easy to apply and may make it more likely that you use it for the full amount of time that is recommended to get rid of any infections. If you are looking for a budget alternative to Tinactin, this generic version with 1% Tolnaftate may work well for you. It is much cheaper than Tinactin, and it contains the same active ingredient. Most find it works as well as the big brand names as long as you use it for the recommended treatment times. A powder that gets recommended by dermatologists quite a lot is Zeasorb Antifungal Powder. Its active ingredient is Miconazole Nitrate 2% that works by preventing the growth of fungus. It is useful in treating various skin infections including athlete’s foot, jock itch, and ringworm. This powder doesn’t have any starch in it, which is a good thing. Many powders do contain starch; this is problematic because it can make fungus worse. The Zeasorb powder is a little on the pricey side, but many find it worth the price because of its effectiveness. If you are uncomfortable putting some of the different types of antifungal creams onto your skin twice a day because of the active ingredients, you may want to check out a few of the natural products that some users are successfully using. 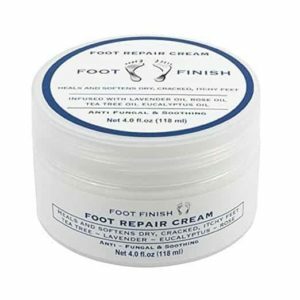 One product that does appear to work for the majority of its users is Foot Finish Repair Cream. It contains Tea Tree Oil (among other ingredients) and should work well with a tea tree oil antifungal soap. It also works great to help soften up any hard spots, relieve itching and help heal cracked skin. 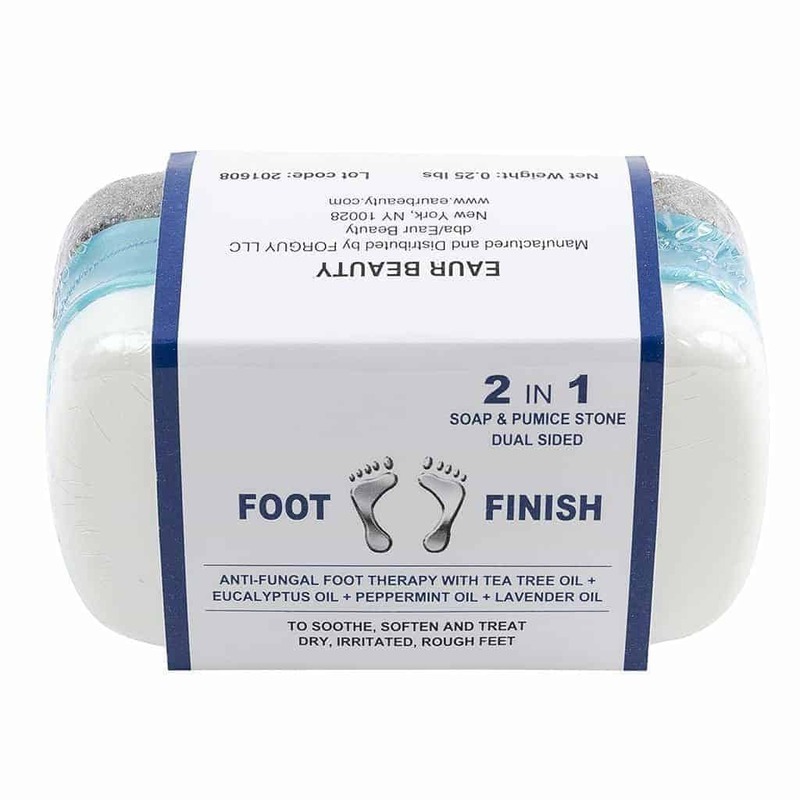 If you are dealing with tough, dry or dead skin on your feet along with fungus, you may want to check out this pumice that has tea tree oil soap in it. You use the pumice to get rid of the dry skin while the tea tree oil soap is working as an antifungal. Most users find this pumice easy to use in the tub or shower and helps to get your feet feeling clean and smooth. 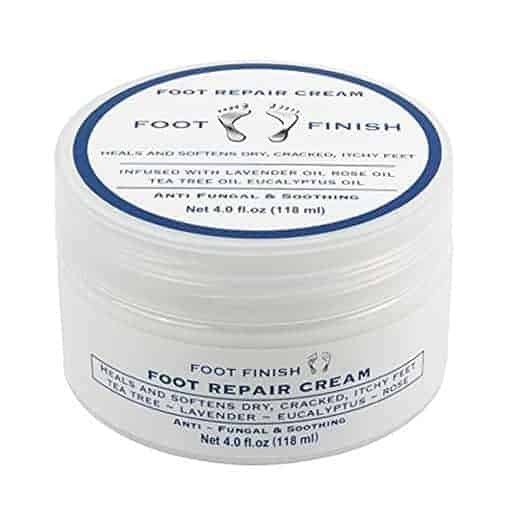 If your feet always feel rough and you are embarrassed to wear sandals, this may be a great addition to your foot care routine. Anyone who has mobility problems knows just how difficult it can be to wash your feet, especially in the shower. One of the most important things that you need to do when you first start to treat athlete’s foot is to clean your feet with soap twice a day. It can be a real problem if you are showering and have trouble bending down to reach your feet. A great solution to this is the Body & Sole Soapy Soles Foot Scrubber & Massager. This scrubber helps make it easier to wash your feet. You just put a bit of soap in the scrubber, suction it to your shower floor or tub, then move your foot over the soft bristles. The Scrubber allows you to scrub your foot clean without having to bend over to do it. What else do you need to do to stop Athlete’s Foot? Do your best to keep your feet dry. If your socks do get wet change into dry socks immediately. Never walk barefoot in a gym changing room or public washroom. In warmer months ensure that your shoes are well ventilated. Never share socks, shoes or towels. Tea Tree Oil-Tea tree oil is a natural ingredient that has been proven effective on some fungal infections. Some people even find it is more effective than over-the-counter antifungal products. It has a strong odor that takes a little getting used to for some people. You can generally find tea tree oil products at health-food stores or online. To make sure you get the best results, look for products that contain 100 percent tea-tree oil. Clotrimazole-Clotrimazole is the active ingredient in the brand Lotrimin, as well as generic versions of Lotrimin. You can use it for a variety of skin infections including Athlete’s Foot, Ringworm, and Jock Itch. It is considered an azole antifungal, which means that it works by preventing the growth of the fungus. Topical and oral clotrimazole is generally regarded as safe for both adults and children. Tolnaftate -Tolnaftate is the active ingredient used in Tinactin; it can also be found in generic versions of the cream. It is a synthetic thiocarbamate that is contained in creams, powders, sprays, or liquid aerosol. It is used to treat some of the same types of fungal infections as clotrimazole. There has been some evidence that it may be a bit less effective than azoles antifungals like clotrimazole. Children under the age of 2 should not use products containing Tolnaftate. Miconazole – Miconazole Nitrate 2% is the active ingredient in Micatin. It is an azole antifungal, so it works by stopping the growth of the fungi. Generic versions are available. Terbinafine –Terbinafine is the active ingredient in the brand Lamisil. It is an excellent active ingredient to look for if you are having a lot of itching and burning with your infection. 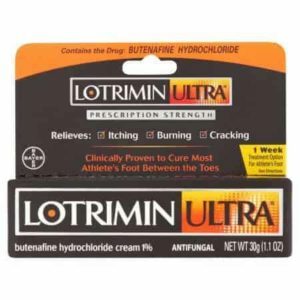 Butenafine -Butenafine hydrochloride 1% is the main active ingredient in Lotrimin Ultra. It is a benzylamine antifungal. Never use it on children younger than 12 years old.